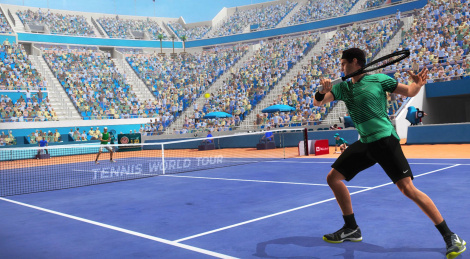 A few days before the finals at Roland Garros and the beginning of this year's E3, we can finally offer you some videos of the Tennis World Tour on Xbox One X. Still plagued with bugs and problems, the game remains playable and we're even starting to have fun playing. Knowing that Bigben's CEO confessed the game was about 20% complete a few weeks ago, it's hard to recommend it though, as they have obviously shipped an unfinished product. The game is already available on Xbox One and PS4, but it will be released on PC on June 12 and Switch on June 19. The videos you will find inside were captured in 4K. "Knowing that Bigben's CEO confessed the game was about 20% complete a few weeks ago". Wow! At least he was honest, though if him and of course, the developers, knew the game wasn't ready to launch, they should have delayed it. Because at the end of the day, they're still selling a product to consumers, and one that they know fully well is not complete. Unfortunately, developers have made releasing unfinished products the absolute norm - not just with games, either, but with software in general. For games, it's best to wait months or even a year to play since you get a heavily patched game with less bugs, more additions, more content and most of the time a special edition. I have lost count of how many games in my back catalog have received special editions 1 year later. Not to mention you also buy them for cheaper. Best solution to combat this norm and the people who abuse it so shamelessly. He also said he had refused to delay the game because he wanted it to be out before Rolland Garros, that it would be patched later little by little and they would would sell a definitive version (aka a finished game) in a year or so. While I understand the desire to release it before Roland Garros to maximize sales, it still doesn't make it right. Same as with other executives in other companies, which all have their own reasons to rush out unfinished games into release and unto consumers. Whatever the reasoning and motives behind decisions like these, they're still selling a product to consumers, people which deserve to have their money and time respected much more than this practice allows. He should at least have made the game a "Game Preview" on XB1 and "Early Access" on PC. Top Spin 4 looks better and it's a 2011 game... Are you now forced to use the gamersyde tag through the whole video? Such a missed opportunity. Why is it no one can do a Tennis game right. Also the colour palette is so cartoony its not that far off Mario Tennis! If it's any consolation, some of the reviews on MetaCritic said this is the best/most realistic Tennis game, only that the bugs and technical shortcomings bring down the whole experience. Might be worth picking it up once the problems are fixed. Though Tennis simulation games aren't for me, I'm still waiting for an Arcade Tennis game like Virtua Tennis 2, which I had a lot of fun playing with friends. Hopefully, Mario Tennis Aces is like that, or at least comes close to it.